Spidertrax Toyota Tocoma 1.25" thick, 6 on 5.5" are machined from 6061T6 aluminum. These spacers are an easy way of spacing out front and rear late model Toyota axles that run hub centric wheels (wheels use shank style lug nuts). Spidertrax wheel spacers is anodized in dark blue, using a double anodizing process for twice the corrosion resistance. In addition, each wheel spacer is wheel and hub centric for a perfect fit. 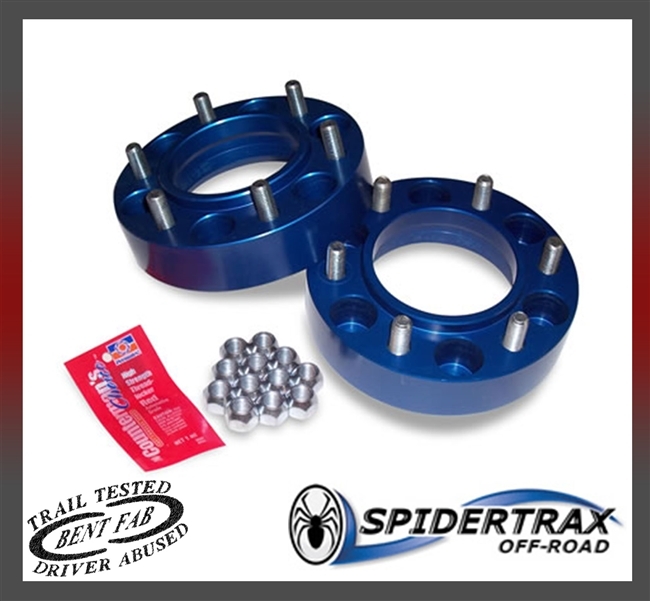 This Spidertrax kit comes with 2 wheel spacers, 12 metric M12x1.5 wheel studs (pre-installed), 12 M12x1.5 lug nuts, and thread locker. **If you are local and looking to get these installed contact us today for a quote.